A black and white negative of Norman Irwin's airplane hangar. There is an unidentified person sitting in a sailboat docked in front of the hangar. The Whitby Yacht Club was founded in the fall of 1933 and disbanded during the Second World War. 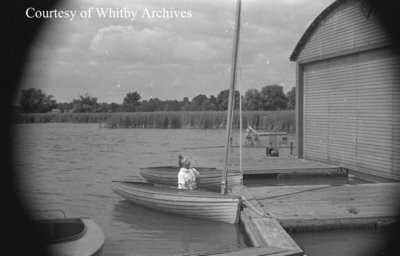 The clubhouse was built on the east side of the Whitby harbour basin in 1934. The hangar was built in 1935. Hangar and Whitby Yacht Club, c.1938, Marjorie Ruddy. Whitby Archives A2013_040_735C.